Gift Guide: RFID Blocking Folders for Wallet + 2 Reader Giveaway! | Focused on the Magic : Gift Guide: RFID Blocking Folders for Wallet + 2 Reader Giveaway! Gift Guide: RFID Blocking Folders for Wallet + 2 Reader Giveaway! This post contains affiliate links. I received one or more of the products for free in the hope that I would review it on my blog. All opinions are my own. Your experience may differ. RFID technology is supposed to make transactions easier by making purchasing and identifying yourself as easy as waving a card in front of a reader or scanner. The problem is that clever high tech thieves can get that information just as easily. Most people don’t even know how exposed they are. Recently I received a set of Credit Card Holder RFID Sleeves for Wallet or Cases by D-Armor for review and submission in our Holiday Guide. D-Armor also very generously offered two sets for a giveaway! There will be two winners. 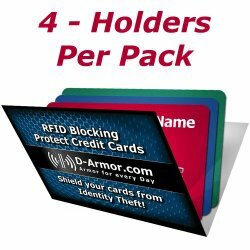 Each winner will receive a 4 pack of RFID Blocking folders. So, who wants to win a Credit Card Holder Rfid Sleeves for Wallet or Case (4/pack)? Scroll on down to the Rafflecopter form below. When I saw the RFID Blocking folders in a news story on TV I couldn't wait to have them in my wallet for protection. I worry about my credit card information and ID theft. It must be a nightmare canceling cards, the stress, worry and damaged credit. High-tech thieves can scan smart cards at a distance, without touching the cards. that protect your credit cards from scanners and thieves. It's a practical, useful and helpful gift for family, friends, employees, co-workers because it protects you against electronic pickpockets who will steal your credit card information right off of your card while it's in your wallet. They can be used in several different ways. 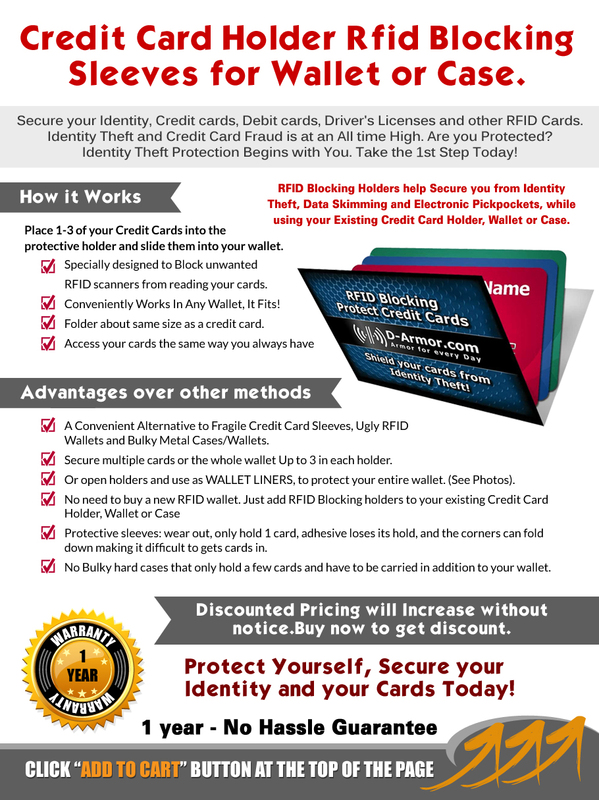 One to three RFID enabled cards can be placed into an individual Blocker. Two Blockers can be placed in front and behind a stack of cards. Or you can use the unfolded Blockers and line your existing wallet making your entire wallet a RFID Blocking Wallet. I rather be safe than sorry. For under $20 I think it's worth slipping my credit cards, bank cards and other valuables into RFID Blocking Folders and protecting my information from unwanted from Scanners and Thieves. It's easy to place them around your passport for traveling too. I use a very small wallet for travel and another when I'm at home shopping. The RFID Blocking Folders slip easily in to any wallet I choose to use. Make a great gift! For more Must-Have Monday posts click here.